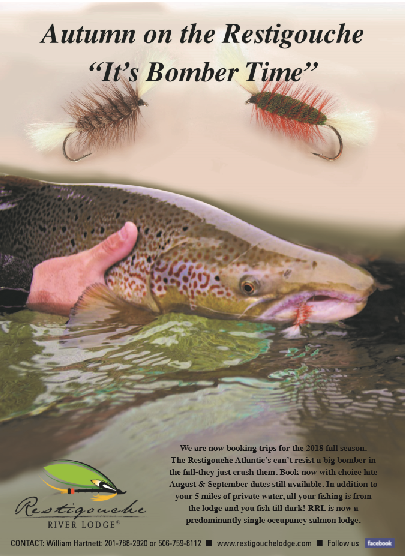 This ad will be in the ASF spring journal. 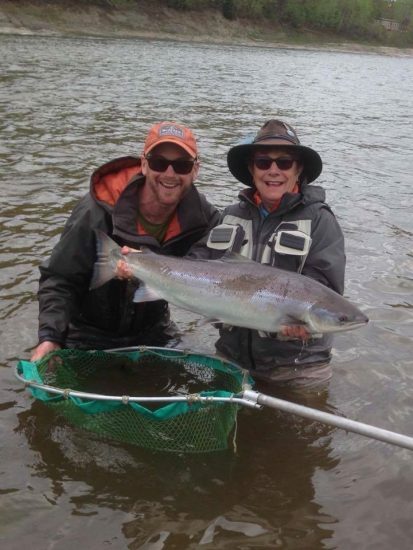 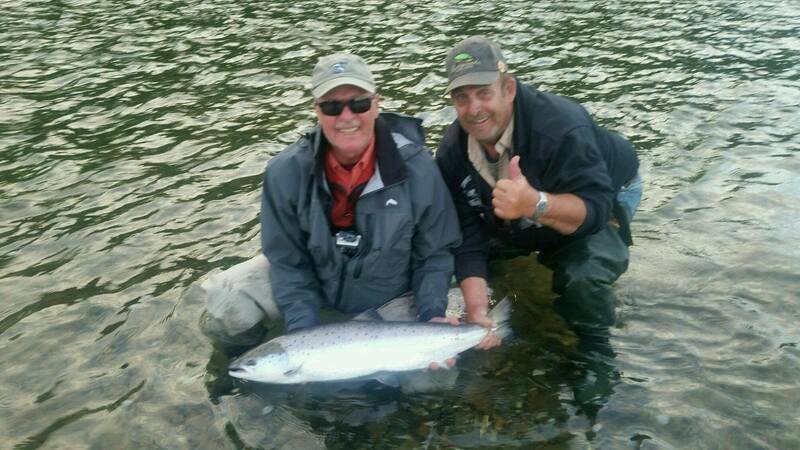 RRL guest Paul with his 27 lb Birthday salmon assisted by his guide Sandy. Paul was in last week and we have another Birthday boy in camp, Doctor Joe. 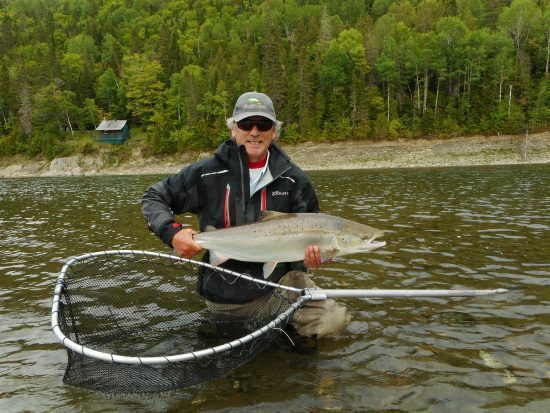 Lets go Doc keep the string going. 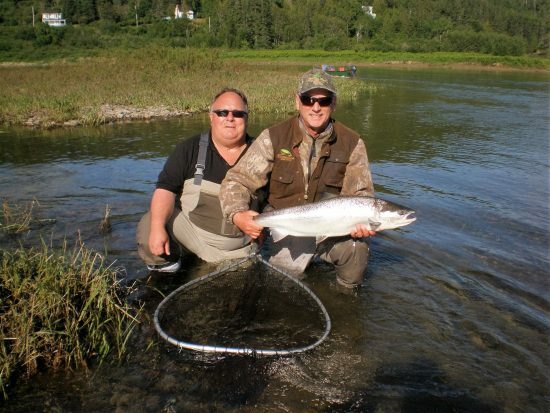 We need rain, but were seeing fish. 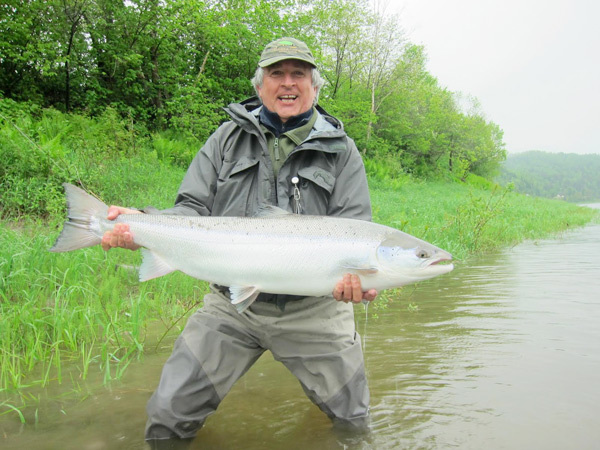 Here is Jere Eshleman’s contribution to RRL thirty pound club. 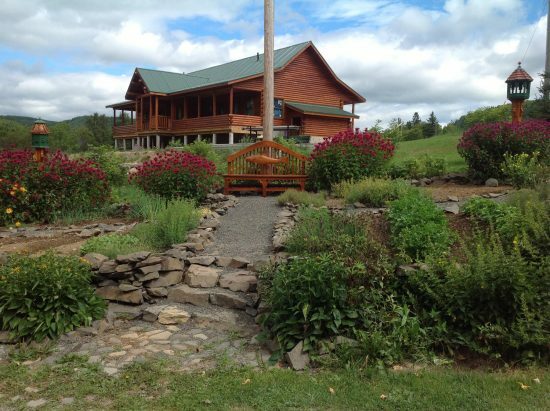 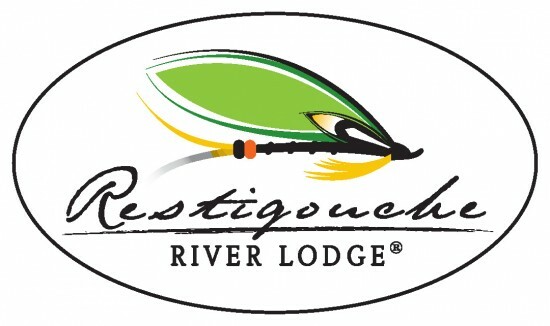 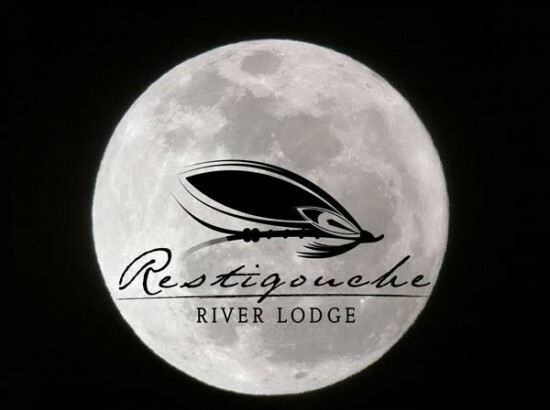 The Restigouche River Lodge would like to wish all Canadians a very happy Thanksgiving. 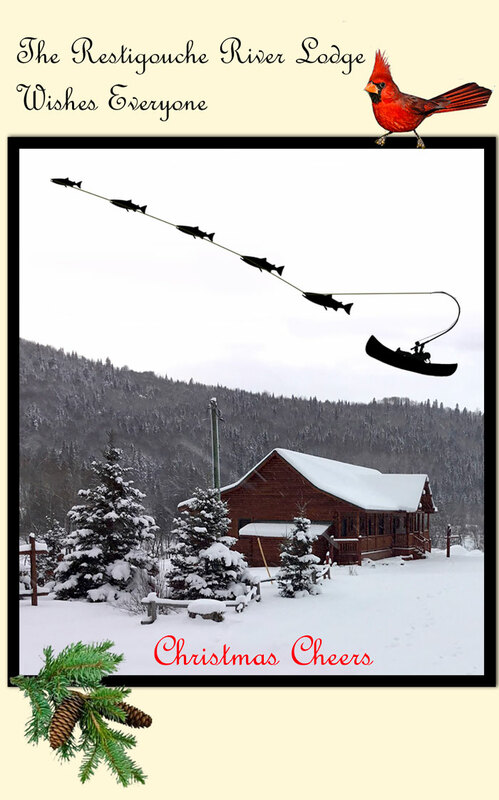 Eat hearty and have a safe holiday. 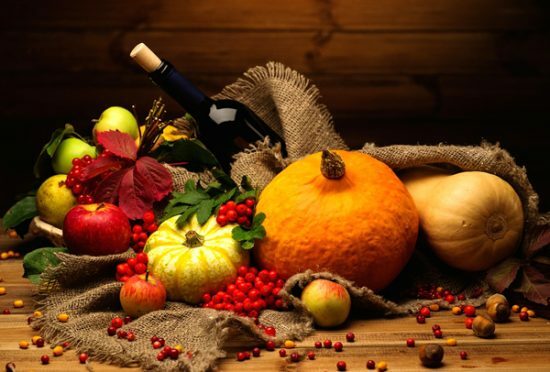 The nice thing for myself is, that due to Canada’s earlier holiday I enjoy two Thanksgiving in one year. 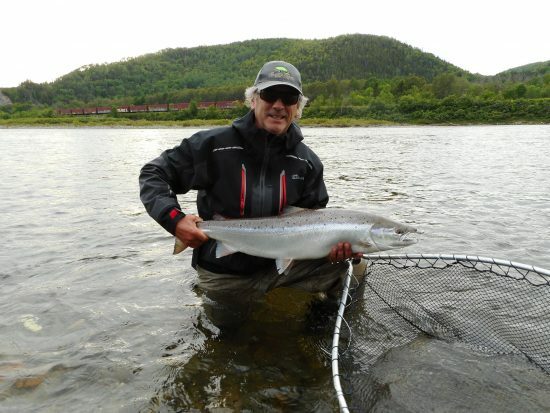 June 12-19, 32 Atlantic Salmon landed! 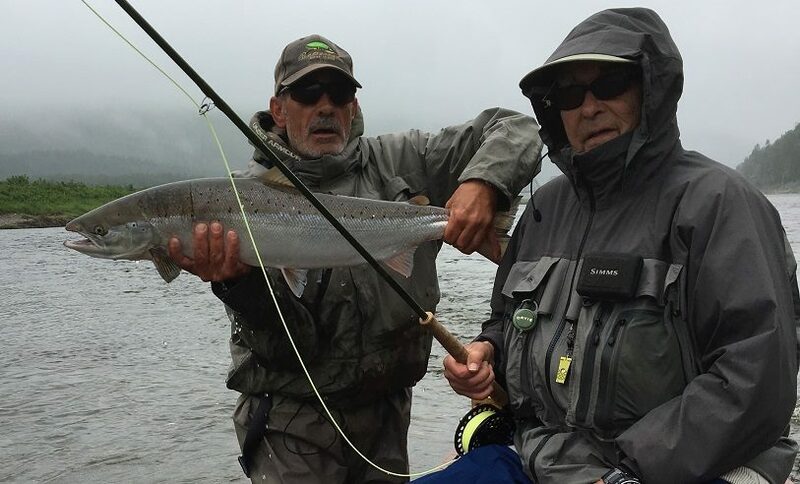 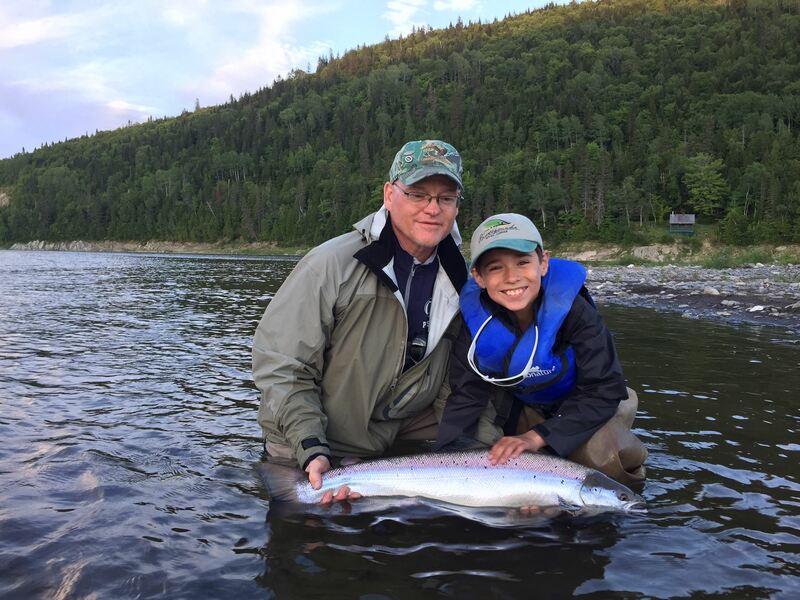 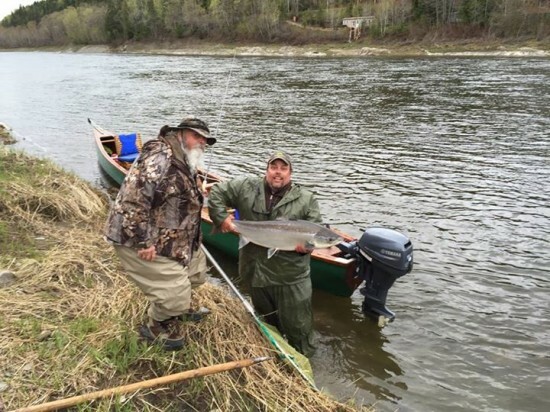 Bill Mellen with his guide Sandy and a 13lb Restigouche salmon. 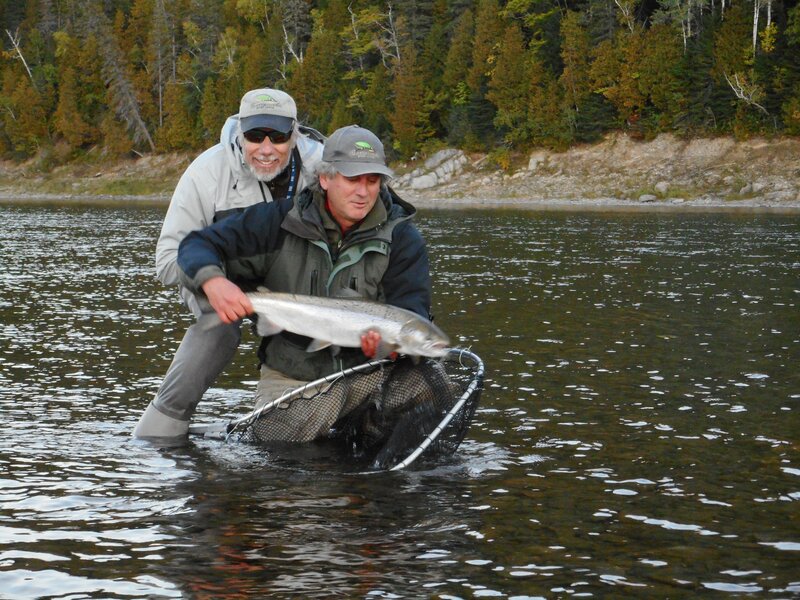 Greg pictured here with Mathieu holding his 30lb Atlantic. Meta and guide Toby with the first landed bright salmon at the RRL. 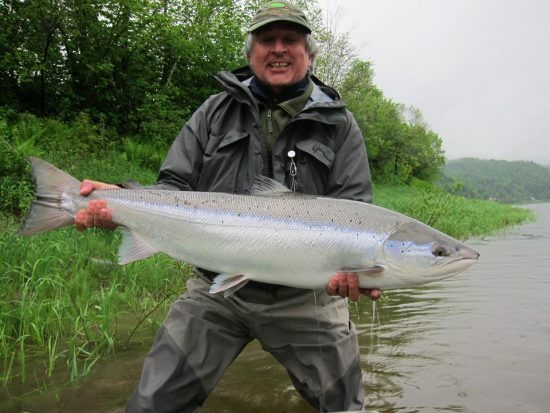 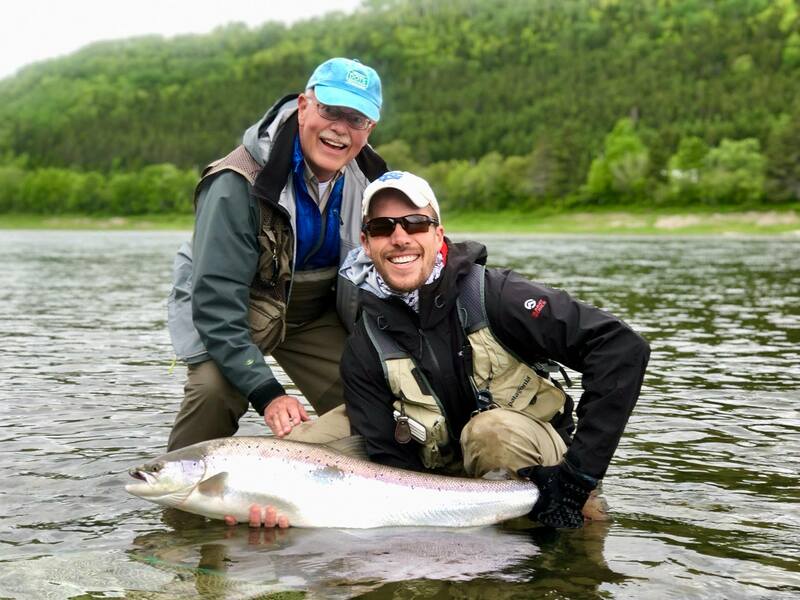 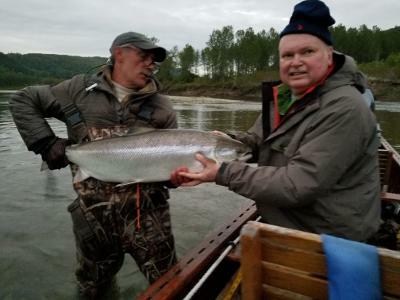 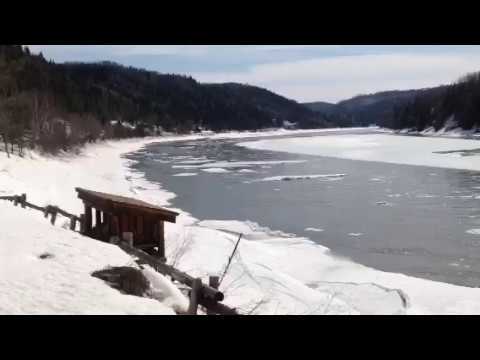 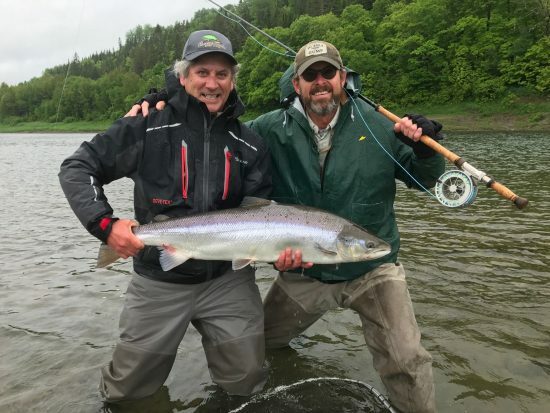 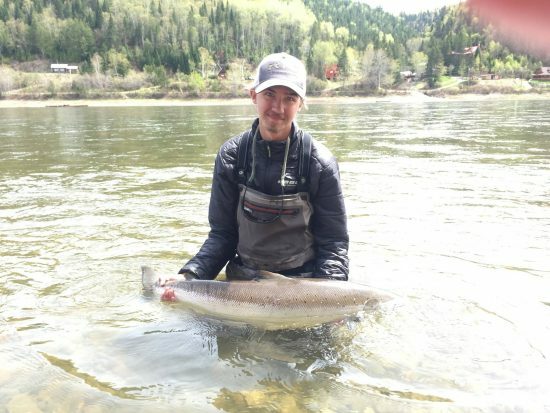 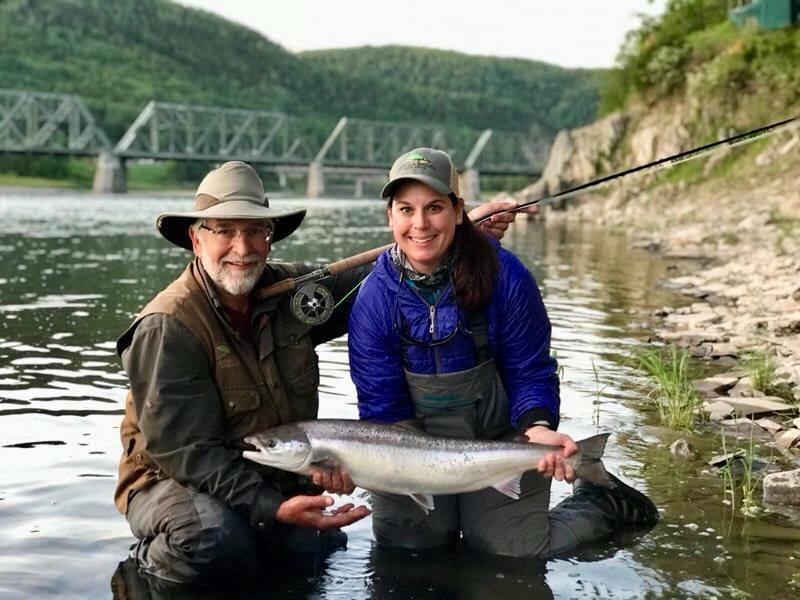 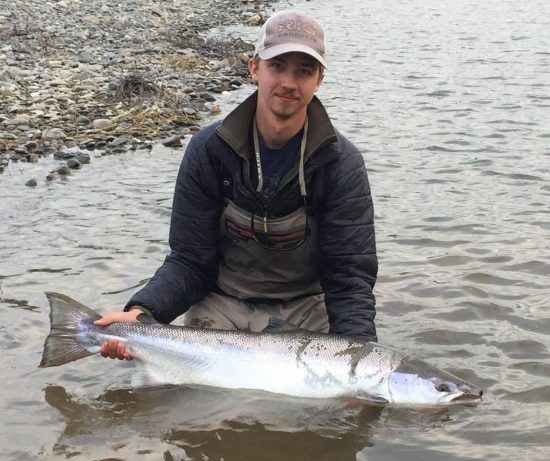 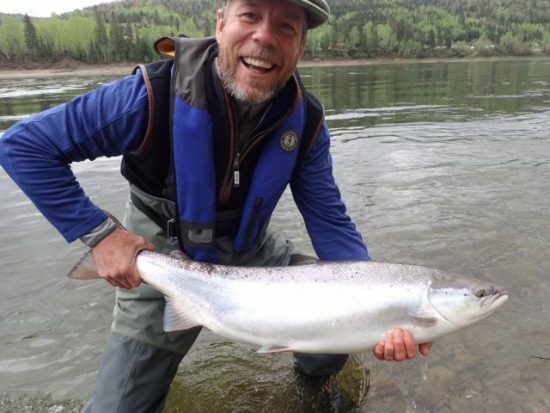 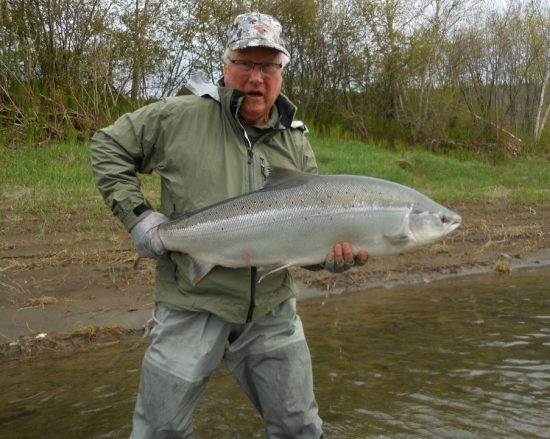 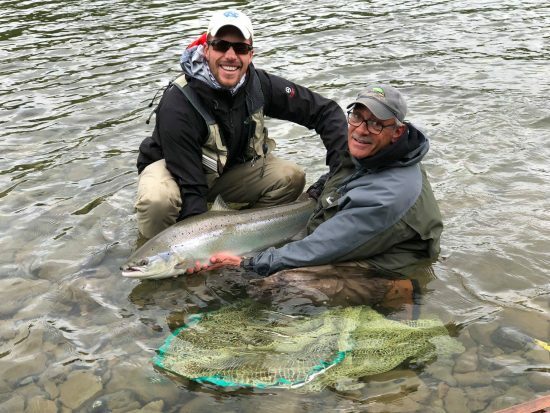 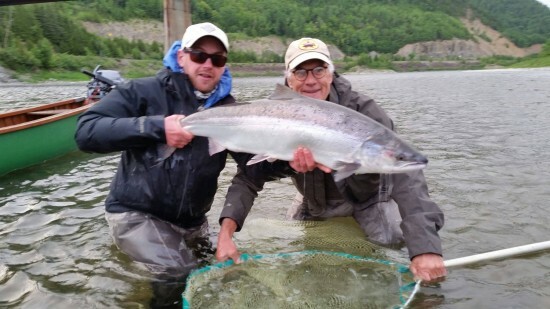 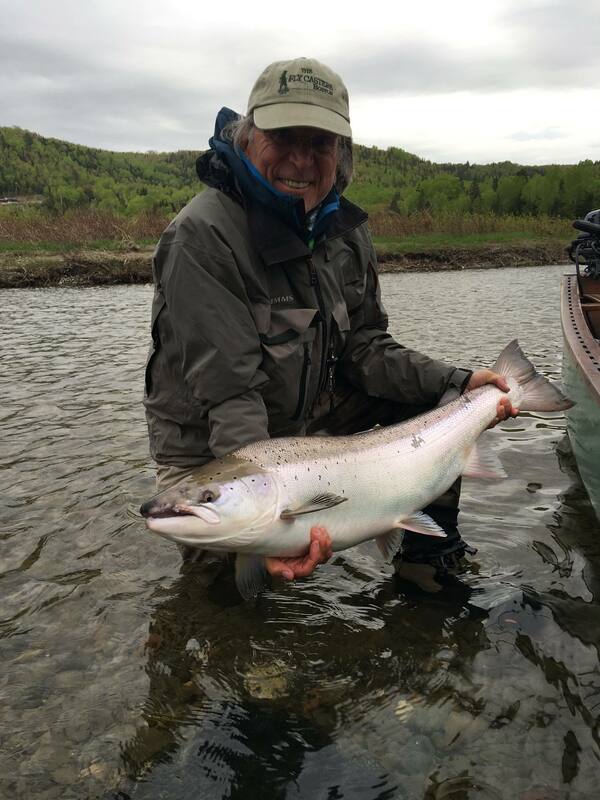 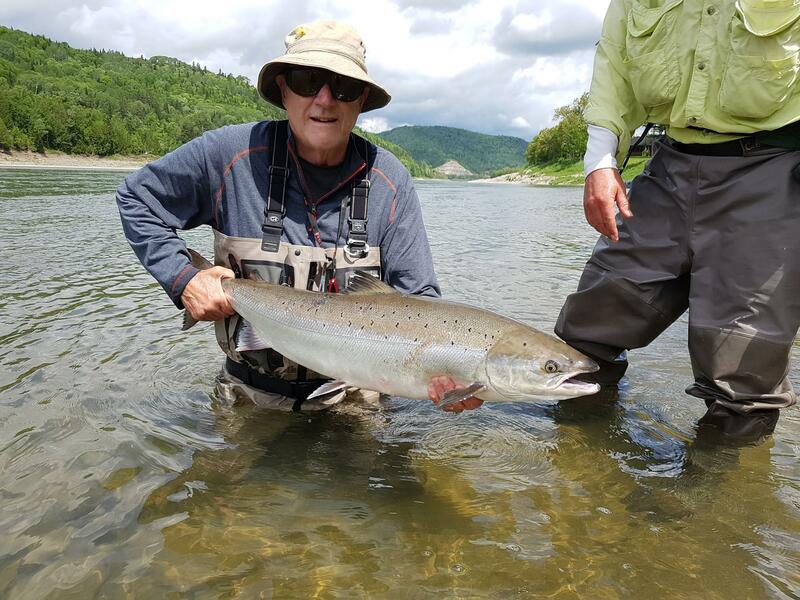 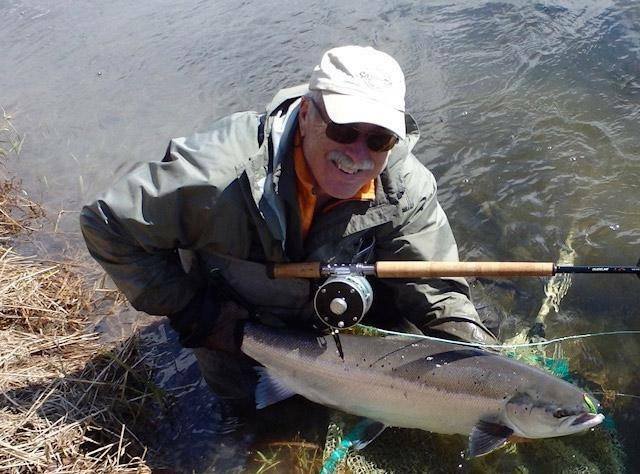 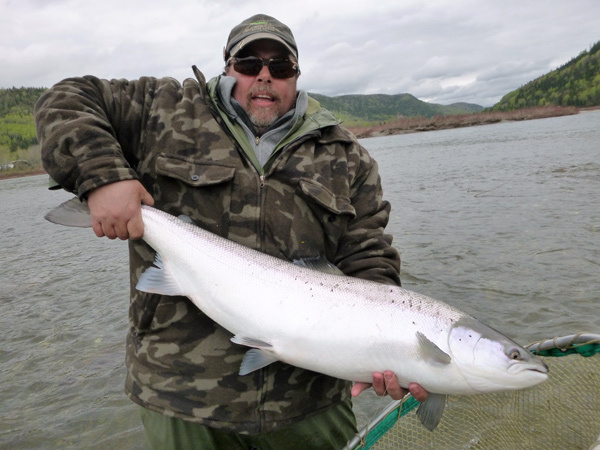 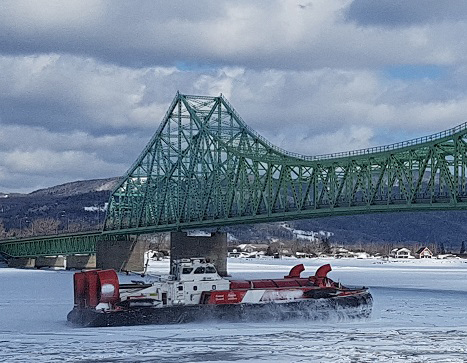 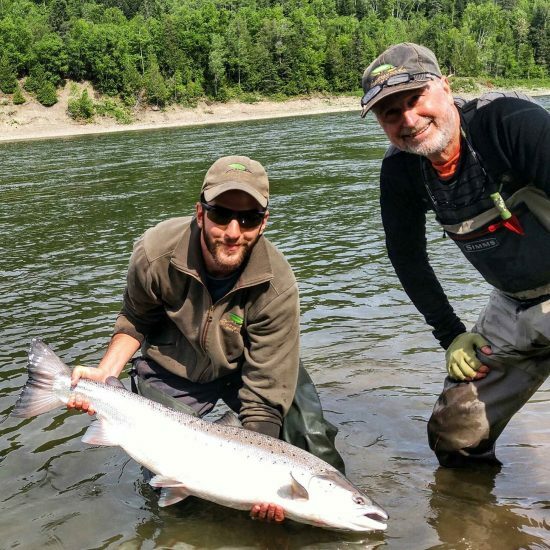 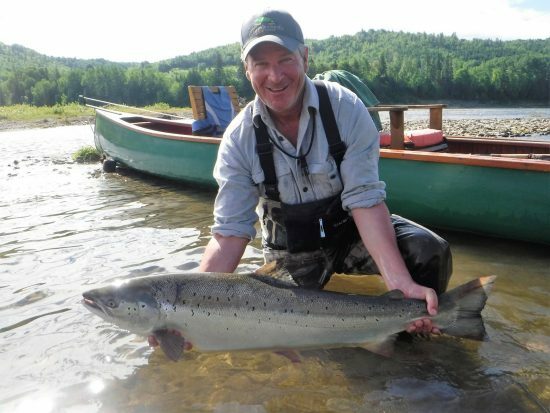 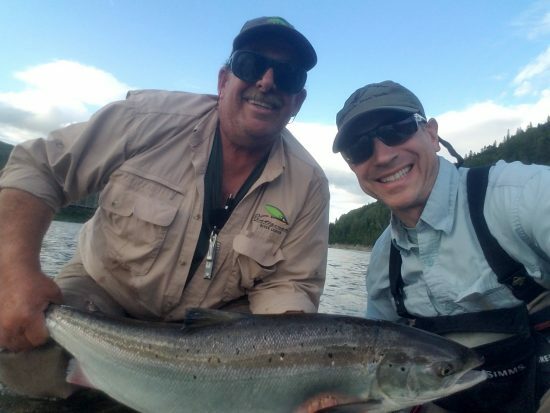 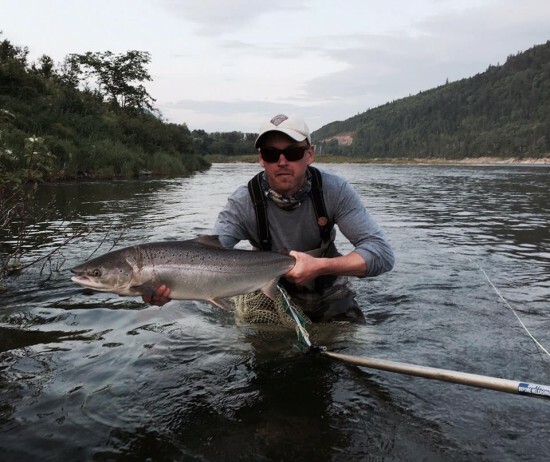 Around the middle of May large hen Atlantic salmon begin to enter the Restigouche River with a few fish arriving as early as late April. 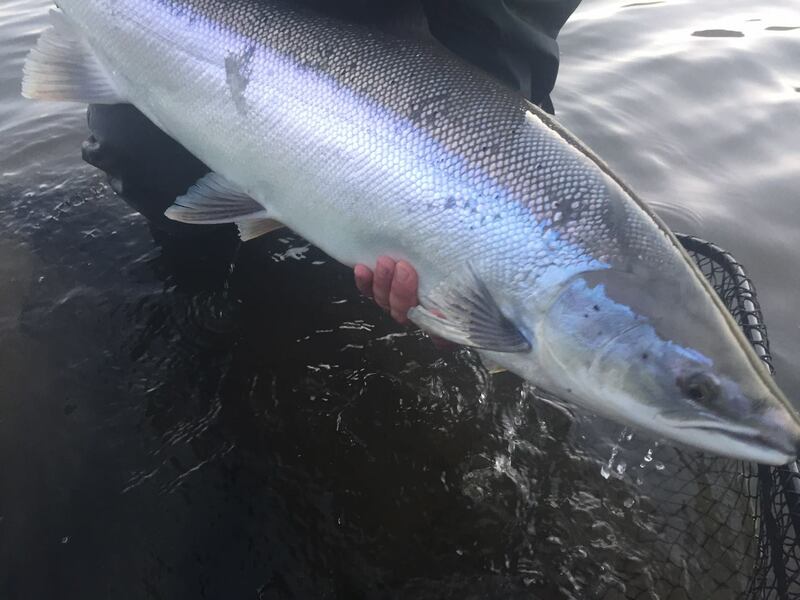 Bright chrome salmon that rival any in the world today. 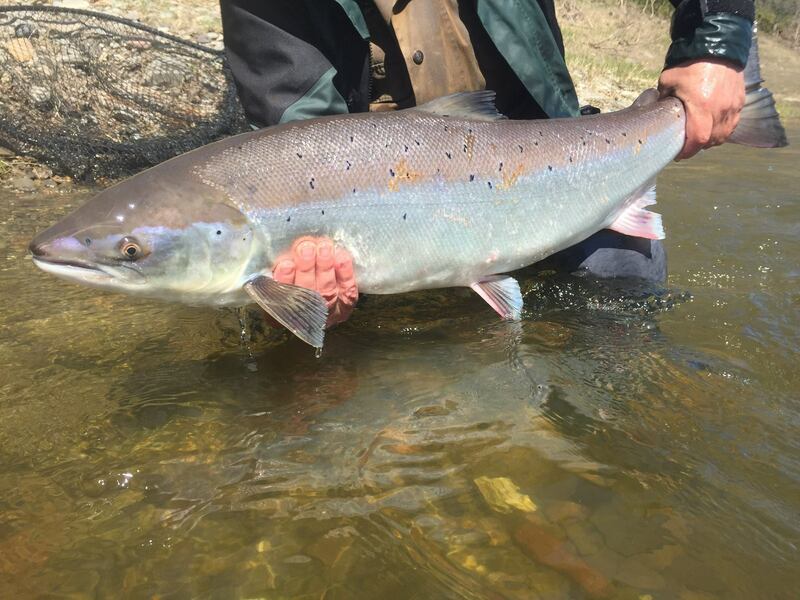 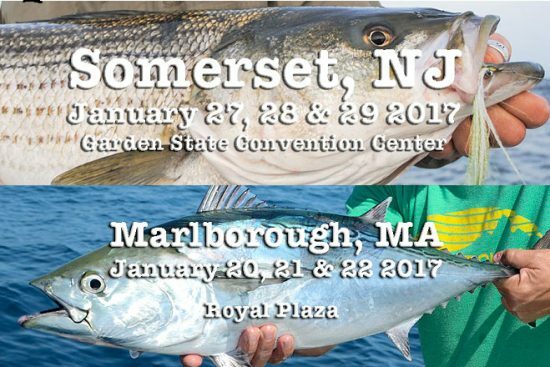 This run of large Atlantics have been the quest of a chosen few and by anglers lucky enough to get an invite on the river. 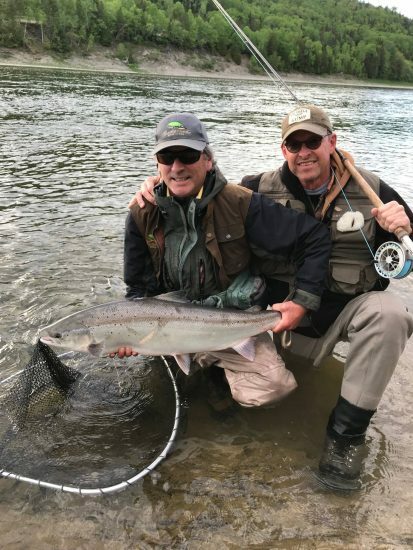 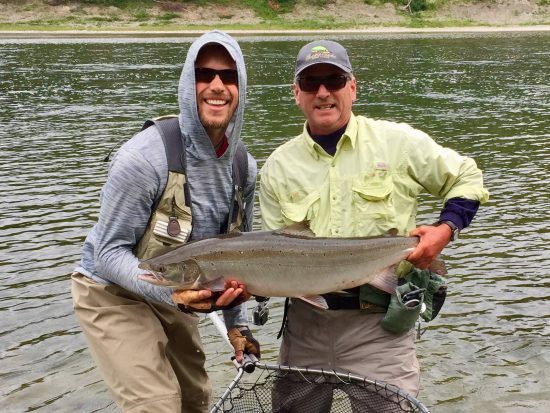 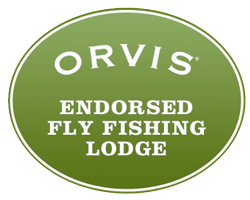 RRL partner / owner Charlie Polsky flew in from the windy city June 27 to fish the river. 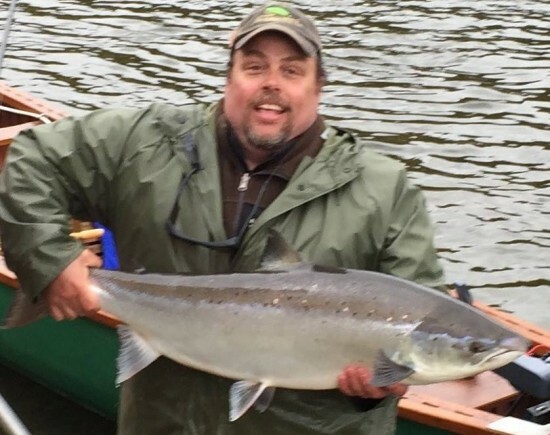 He casually got on the water around 6:30 and plucked a 35 lb Atlantic from Home Pool within an hour. He then retired to the fire pit to take in all that had just happened. 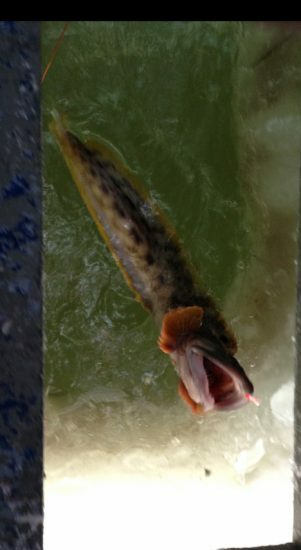 The fish took in the middle of Home pool after coming back to a Picasse the second time. 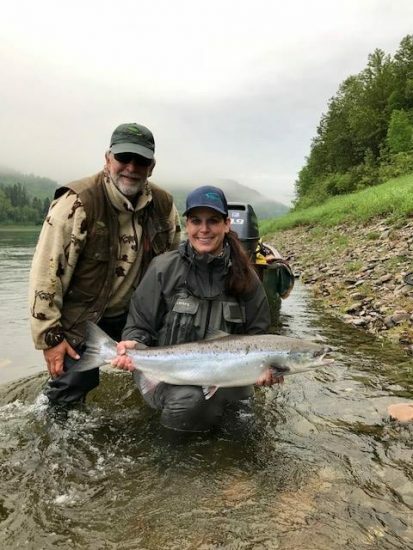 She fought Charlie hard, four times well into his backing and landed the big girl well beyond the ledge. 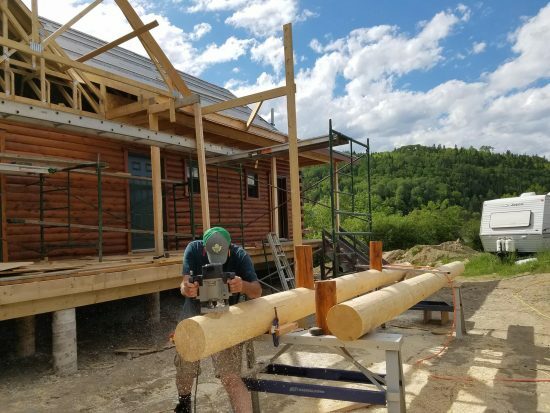 A slow start but things are heating up. 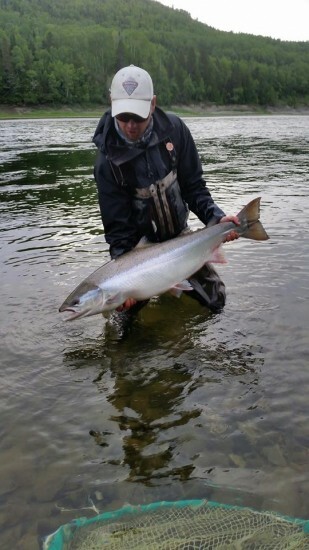 We have been off to a slow start this season but over the last few days good numbers of large salmon have been spotted. 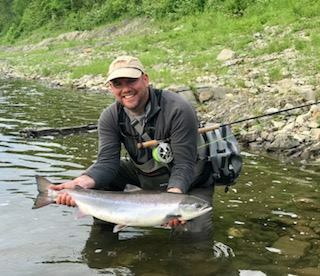 On June 16 angler Anthony rang the bell raising two salmon dropping a 14 and cashing in with a 35 lb hen from our Poker Pool. 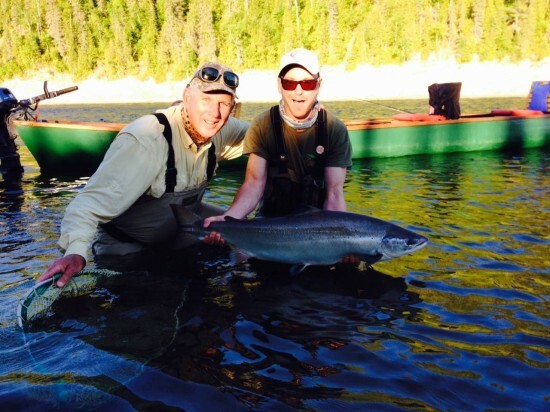 They lost the photo opt but the memory is fixed between the ears of one happy face. Sandy a new guide at the RRL got his first big Restigouche Fish what a way to start. 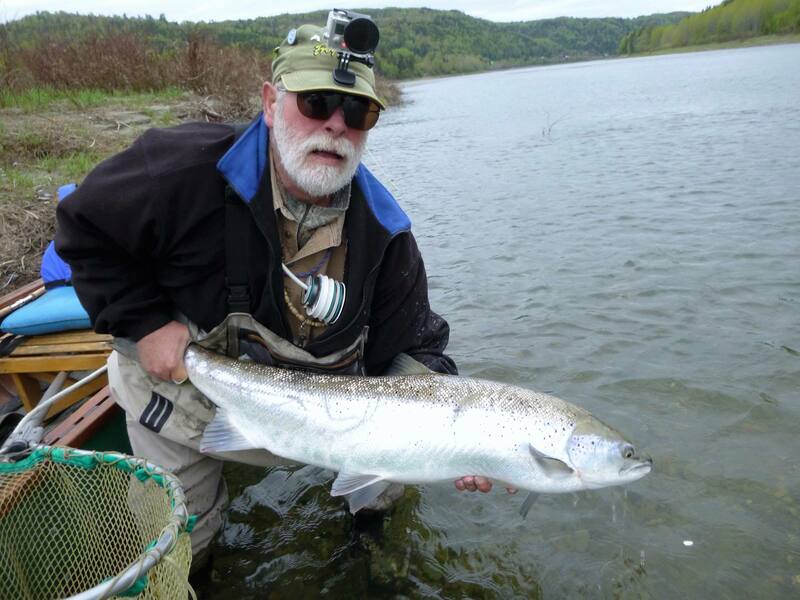 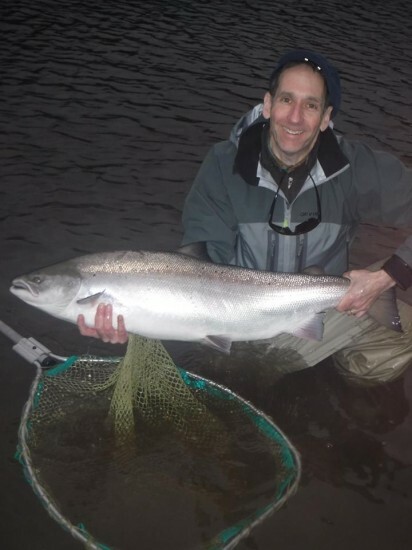 Guest Roger improved the streak with a 12 and 14lb salmon from Ledges and Home pools. 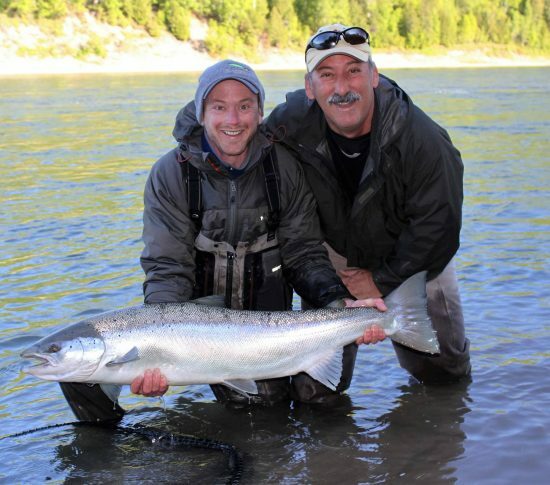 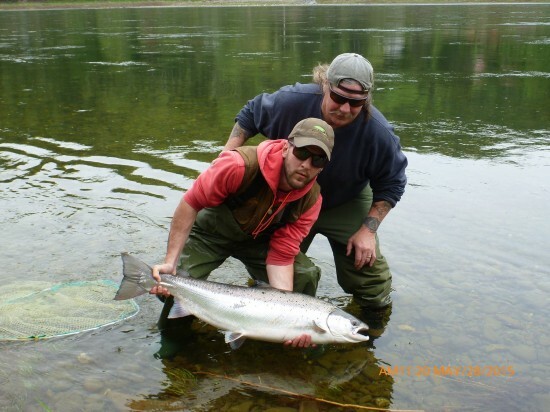 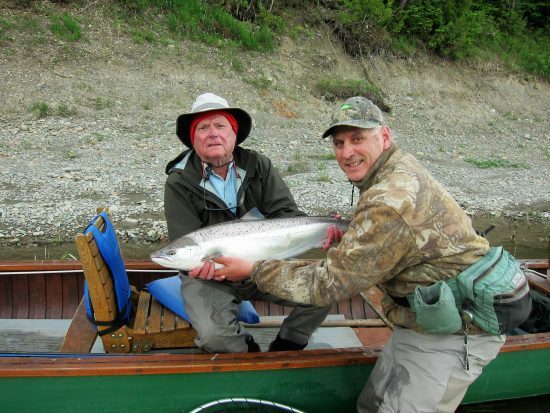 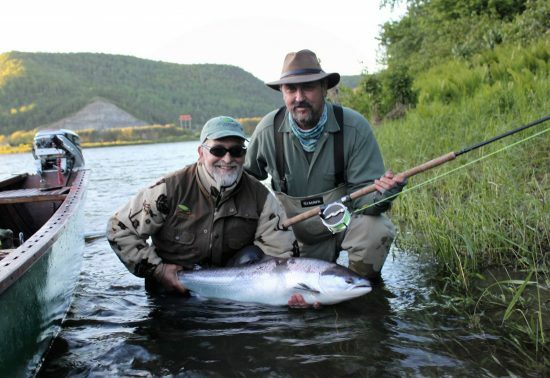 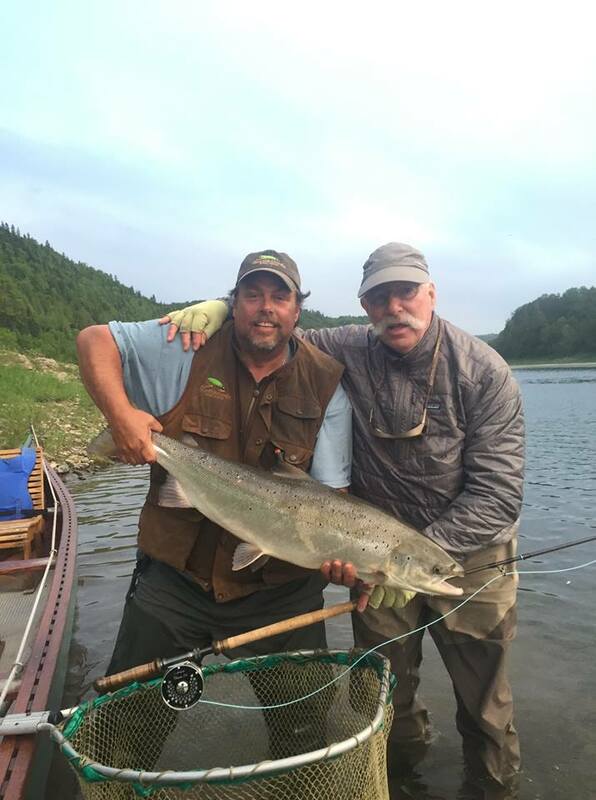 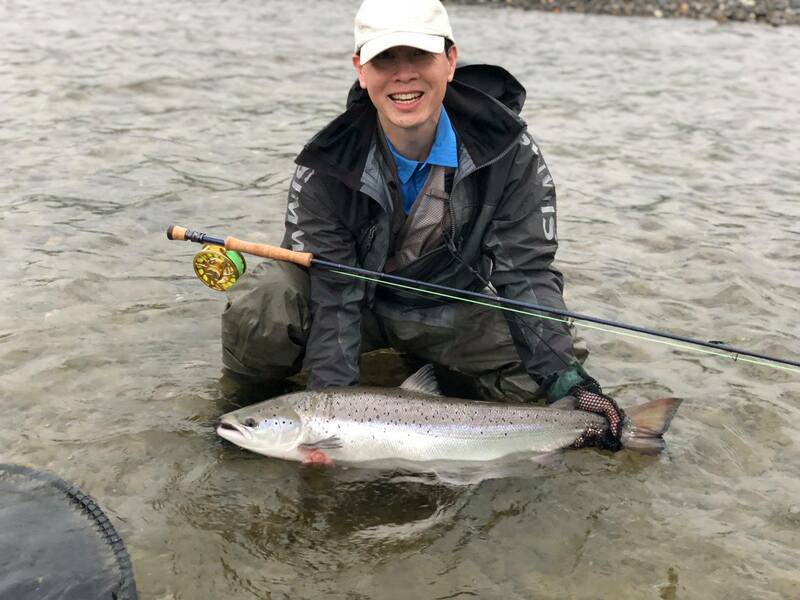 June 20, RRL guide Toby and a happy angler Ken with his 32 Lb Atlantic salmon. 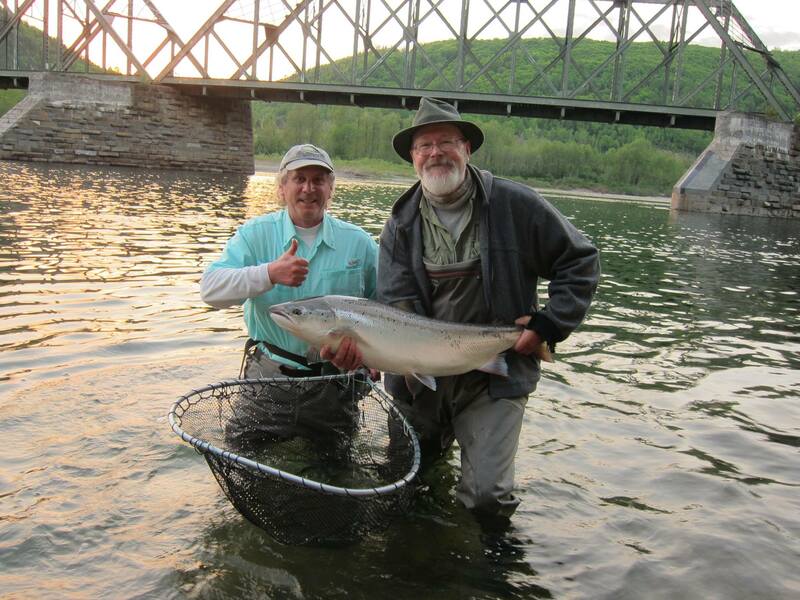 Weight was calculated using Ally McGowan scale of length and girth. 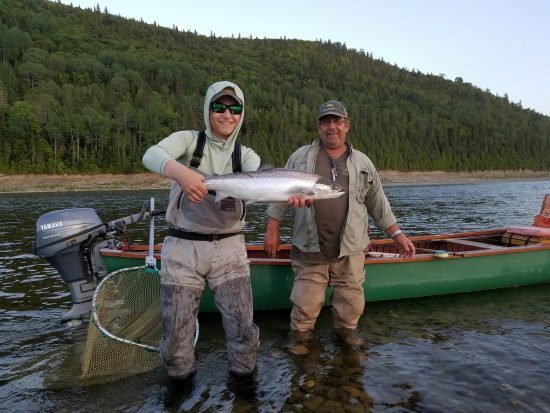 The first girl of the 2015 Atlantic salmon season. 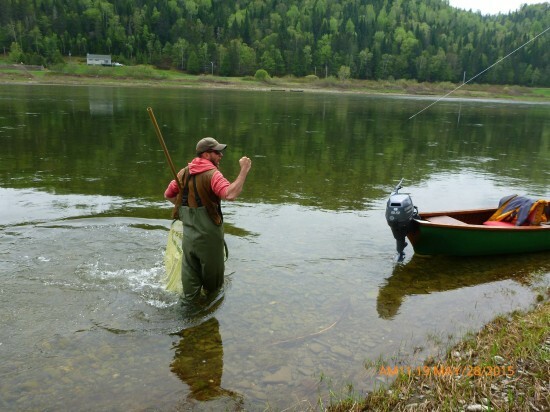 The river is in peak condition and a gang of sports are due in.